SYNOPSIS - Otherland is out of control. Fleeing through broken realities, a small band of adventurers struggle to avert the nightmare that Otherland could become. The only hope may lie in an alliance with their enemy. But time is running out - and Otherland's most terrifying secret is yet to be revealed. EXCERPT - By the time they had gone through their third miserable night's sleep in one of the mountainside's narrow crevices - 'night' signifying only the period during which they stopped walking, because the black peak remained in perpetual twilight - even the violent angers of the first camp had disappeared. Felix Jongluer barely mustered the energy for the few necessary communications, apparently avoiding even contempt as a waste of resources. Renie's fear and dislike of him did not disappear, but in the dull slog of routine and the occasional shock of accident it receded into something at the back of her mind, a small, cold thing that slept. Even Sam, despite her loathing of Jongleur, began to lower her guard a little. She still would not speak to him, but if she stumbled and he was the one in front of her, she would reach out and steady herself on his naked back. When the last part ended, Orlando was killed by one of the Grail members, though he and T4B managed to kill him too. Jongluer, Renie, !Xabbu ans Sam were separated from the group, while Paul is once more alone without even Martine and her group for company. Dread has control of the Other and has slowly started laying waste on the different worlds across Otherland. What i loved about the final part is that for the first time even precedence is given to Real Life incidents. It was refreshing to see Ramsey and Sellars and rest of the characters in the story get more importance than Renie and Co. And again, Williams kept Beezle out of the book till the last 300 pages. God, i missed him too. Though we all had a clue about what the OTHER was and we knew that somehow Renie and Co. were almost at the heart of the Operating System, more than half of the book was spent running from one monster to another. Renie gets separated and is helped by a little girl who's made of mud. Paul manages to track down Martine and the rest with the help of Kunohara whose world is shattered by Dread and his recruits. As Martine and her group travel from one disaster to another, !Xabbu again starts his story telling techniques to help him find Renie. Personally speaking, that gets a bit too much for me at times. !Xabbu is at best awesome when he uses his intellect to solve problems. Meanwhile in Real World, things fall apart as Sellars team gets into trouble with one of the Grail Members. Joseph and Jeremiah's hideout is attacked by killers under orders by Dread. 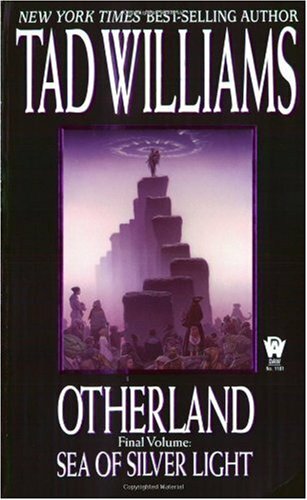 In Otherland, Paul is captured by Wells in Egypt and tortured where his past is slowly revealed before Martine and the Wicked Monkey Tribe manages to free him. Dread can give even serial killers a ccomplex. He is the most twisted character ever! Dulcie manages to sniff through his personel files to find out about his past. Meanwhile the Australian police orders detective Skouros to stop investigating the first Dread murder. The ending just blows my mind. I felt another book was necessary as it felt like one whole book was crammed in the last 100 pages. Its finally revealed that the Other is a human child. A child whom Martine taught when she was still a child. His brain is placed in a satellite orbiting over Earth. For a moment, everything was utter fen-fen as Williams started explaining things. How Olga is involved, the truth about Sellars, the new life created that is finally released into space in the form of light until they find a place to survive. Gardiner comes back with a vengeance and boy oh boy, i was jumping up and down. In the end, the bad boys lose. The good guys win, but with major losses. Paul is dead in the simulation, it was proved that the Paul character in the simulation is just another copy while the real Paul is lying somewhere at Jongluer's hideout. After Paul awakes from two years in Otherland, he wakes up with no memory of his friends and Martine or anything related to Otherland. Gardiner is dead in the Real World but is alive in Otherland. Renie and !Xabbu finally make out, even if its in VR. The survivors make a pact to save Otherland as this is the only way they can keep Orlando alive. The book ends with Sellars team suing Jongleur's multi-corporation, the kids in coma finally waking up slowly and Beezle and Gardiner's parents meeting Orlando in Otherland. *phew* This has been an epic book. Cross that, an epic saga. One of the best sci-fi series. LIKE EVER!!! I wish i was one of those characters, sharing their pain, celebrating, running and hiding, fighting back..... Tad Williams, i bow to you. My Rating - 4.8 out of 5. It can't get any better.